Cheaper food than onion soup is hard to find – and more flavorful too, for that matter. Despite being such a cooking essential, onions rarely get the spotlight all to themselves. 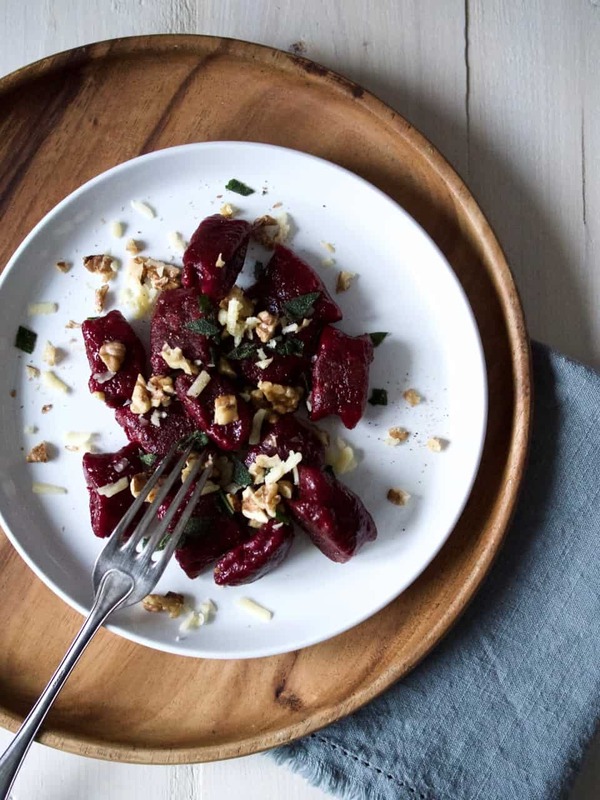 With the winter season (almost) coming to an end, we definitely have to dig deep into our pantry and really scratch our heads in order to come up with inventive, fun things to cook. It seemed a great opportunity to allow the good old yellow onion to shine, in other words. 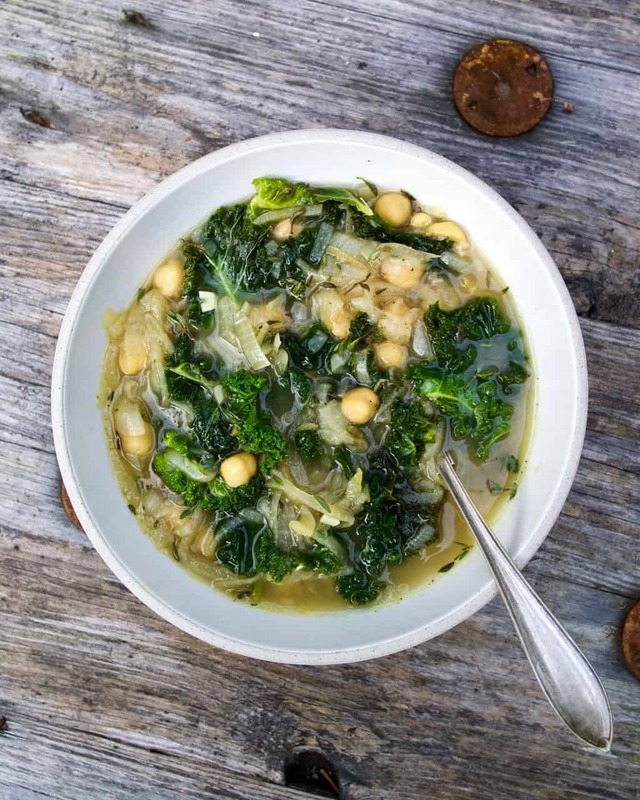 Onion soup is a classic, of course, but here’s a jazzed up version with both chickpeas and kale, for a nutritious ad well as colorful winter soup. Enjoy! Do you ever experience fear and feel scared? I do. In fact, I think I’ve spent more time with fear than any other emotion throughout my life. But it’s a complex concept, fear. Personally, I’ve been both carefree and adventurous, gone bungy jumping, sky diving and traveling all over the world without so much as a hint of a safety minded approach. But making a phone call to someone unknown – be it a new hair dresser, the tax agency or the local supermarket – and I start sweating. Over the years, it’s become quite clear what categories of life situations freak me out and the ones that don’t. Recently, however, I’ve experienced a sudden and quite overwhelming change in my emotional life. Up until about 6 months ago, I’ve been very whatever as far as any physical issues or problems of mine. I’ve only been to the doctor a handful of times in my life (and those times were all following horse related accidents) and haven’t spent many seconds worrying about my physical health. And then my mom got breast cancer, almost exactly 1.5 years ago. Wait, chickpea balls? Seemingly covered in chocolate? Calm down. It’s not as crazy as it might sound. 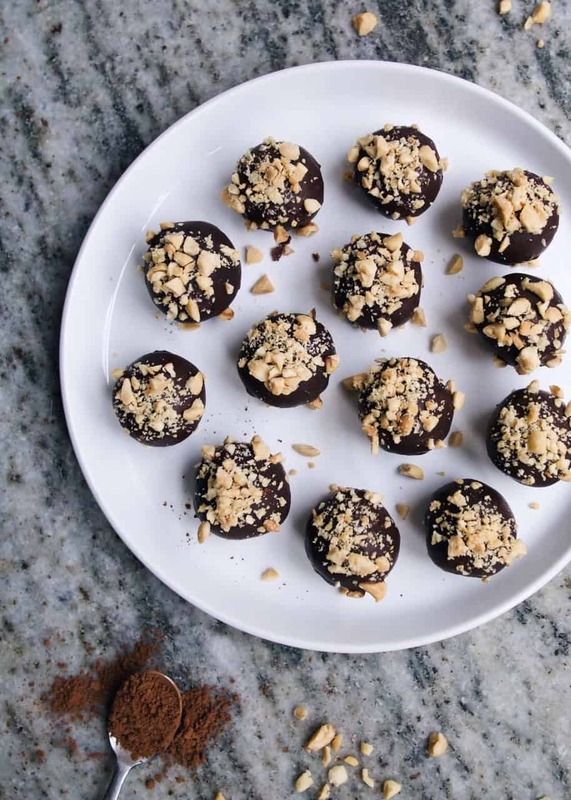 Mike suggested a while back we could try making an energy ball using chickpeas as the main ingredient, his mind obviously thinking of ways to make these types of snacks nutrient dense and perfectly acceptable to munch on whenever. An overall balanced diet usually provides us with all the macro nutrients we need, thus no need for the protein-packed this or protein-packed that even for us mostly plant-based folks, but listen to the micro nutrient bonanza in these balls: heaps and heaps worth of folic acid, vitamins E and K plus B1, B3 and B6, selenium, zinc, iron, phosphorus, calcium, potassium and magnesium. 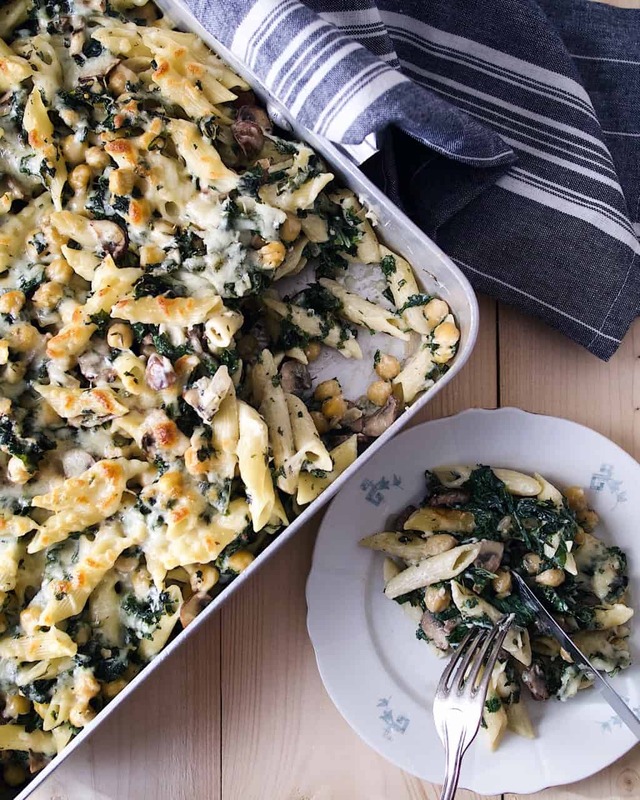 Our inaugural recipe featuring mushrooms is finally here! Even though we both like mushrooms and cook with them fairly often, we haven’t managed to put together a recipe that felt good enough to share until now. This one is as easy as can be, and quite the perfect weeknight dinner – plus, it can prevent food waste by inviting leftover pasta into the mix. Here, we’ve gone for (frozen) kale from last summer as far as the vegetable, but it’s easy to picture how this dish could look different throughout the year. Broccoli florets, spinach, Brussels sprouts… options are endless as we move through the seasons. That’s really all there is to it – enjoy! Bean dips. Bean spreads. Hummuses. Staples of our fridge. Easiest things to make and best hanger-rescues there are. I could just keep going: they are cheap, packed with nutrients, easy to adapt based on season. 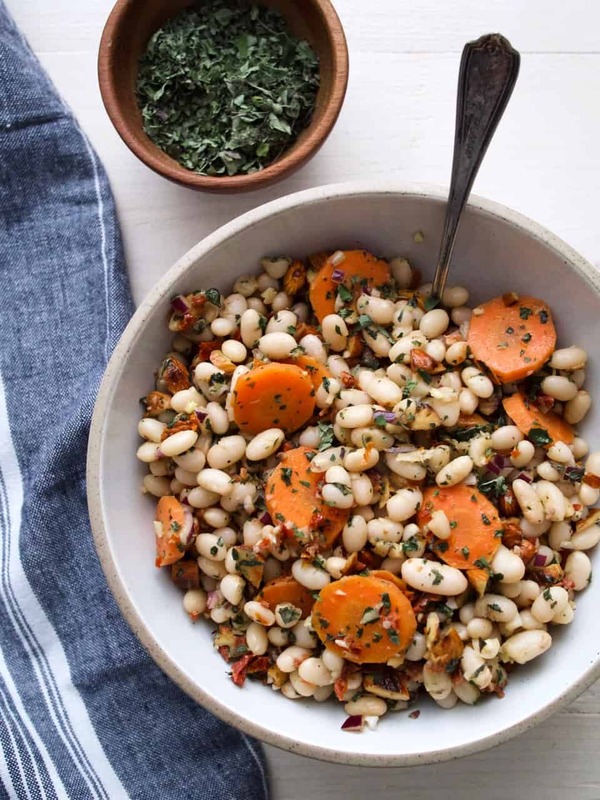 Yesterday, we finished an entire tub as a mid-morning snack (actually, it was the butternut squash version you’ll see below that we dug into – it might very well be our favorite bean spread ever). Best afternoon-pick-me-up is a slice of bread, a thick layer of bean spread and a crispy vegetable on top. If we’re feeling fancy, we’ll go all in with a sprinkle of sesame seeds as well. Ah, the small things in life. Throw in some spring sun, which would mean snacking takes place while sitting on our deck, and we couldn’t ask for more! Appreciating those glorious moments in the day-to-day is key to contentment, we think. Taking the time to stop for a second, take in your surroundings, look up from the screens, notice the weather and the seasonal changes… to us, those are all crucial aspects of a life in harmony. And apparently, bean spreads can be a great help along the way! This past summer, we made about a gazillion of these Chocolate Zucchini Muffins, using up the zucchinis that had grown waaaayyy too big for “normal” eating. We (obviously) ate a lot of muffins then, preferably when soaking up the sun somewhere, but we could also put many in the freezer for later. We literally just finished the last ones from the summer – which can serve as an indication of exactly how many we actually made – and so, it was time to make new muffins. 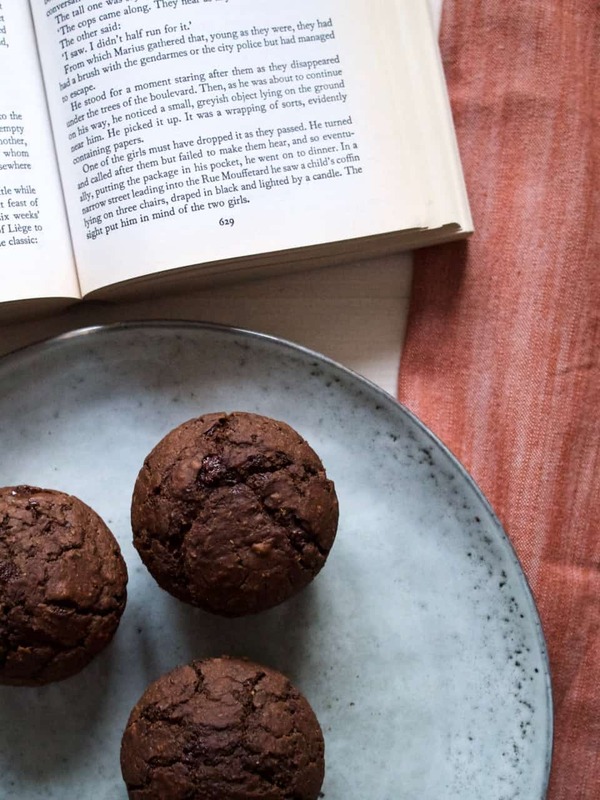 Because really, isn’t it just unbeatable to have chocolate muffins in the freezer that you can defrost in no time and fend off any blood sugar dips with? It is to us, at least. But with no zucchinis on hand now, during the winter, what to do? 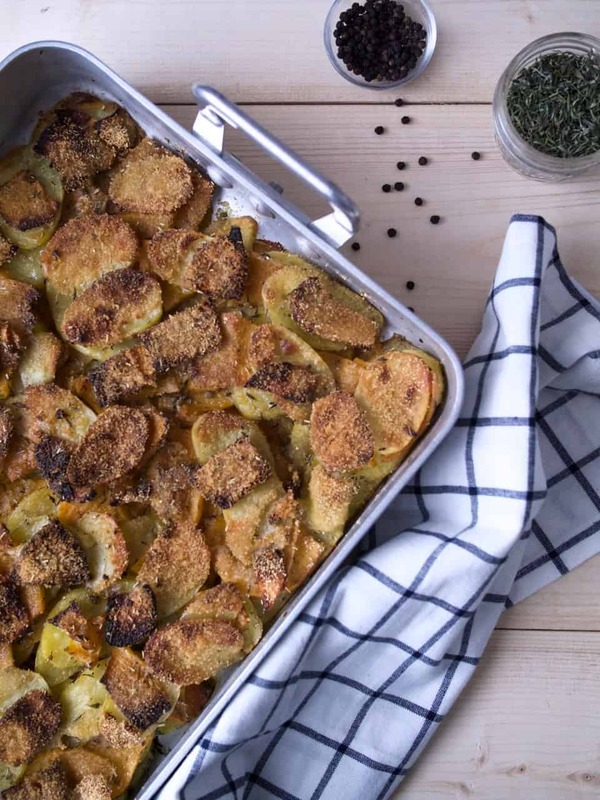 Introducing: winter squash. With essentially endless storage possibilities, winter squashes can be used throughout the whole dark and cold season, all the way until the garden is back to former glory. By making a puree using butternut squash, you’ll end up with the most moist, borderline sticky, muffins ever. No dry crumbs here, be sure of it. I was, after all, raised by my mother – a fan of all things sweet and dessert-like, and with a strong preference for stickiness and gooeyness. We buy potatoes in a 5 kg (10 lbs) bag from the store. It’s the best. We store it our pantry, and can dip in there whenever we feel up for a quick and easy, yet filling, dinner. Boiled or roasted potatoes with veggie patties and a dipping sauce on the side is a hit any day of the week, and we’ve come to like it as the meal we eat the night before a long run. Definitely proudly fueled by potatoes, over here! Eating “regular” potatoes has been an ingrained part of my life since, well, forever – here in Sweden, most people have it at least a few times a week. But with the wave of low carb diets and whatnot that swept in some years ago, potatoes have gotten themselves a bad rap (and an unbelievably unfair such). Sweet potatoes are being adored left and right, thought of as something much “healthier” (oh we’re so sick of that word!) and overall ranked as a wiser dietary choice than regular spuds. Poor regular potatoes! We won’t give in to the potato-discriminators by giving space for a side-by-side comparison, but let’s just get a few things cleared out. Regular potatoes contain a touch more protein than sweet ones, but the latter has a little more fiber. They’re fairly equal as far as caloric value, and they contain a range of vitamins and minerals (although different ones) respectively. 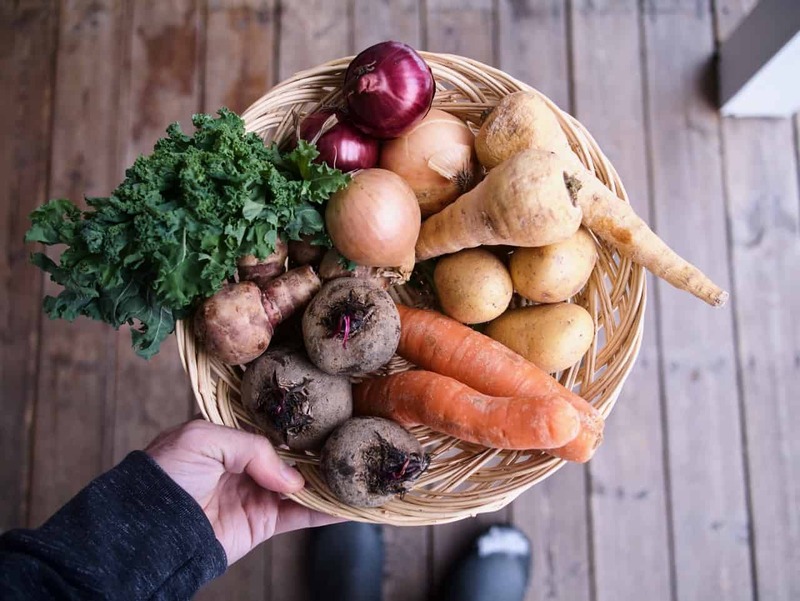 If sweet potatoes can be called a “superfood”, then regular potatoes can too – but we’d prefer it if we just eat nourishing food without labeling everything something. Ok? In all honesty, this wasn’t meant to become a share-worthy recipe. We were making dinner a few weeks ago, and the scene was really a whole mishmash of leftovers, summer veggies pulled from the freezer and some potatoes from the pantry. We were lacking sufficient protein, so I decided to whip up a side salad with beans as the main ingredient, while Mike was managing the rest of the pots and pans. The outcome exceeded our expectations, reminded us of a dish we used to cook often back in New York, and left us if not hungry for more that day, as least interested in making it again. So we did. And then a third time. And after that, we deemed it recipe-worthy, so… here it is. A while back, I wrote my inaugural food-themed blog post (A few thoughts on food and nutrition) and I loved putting it together. 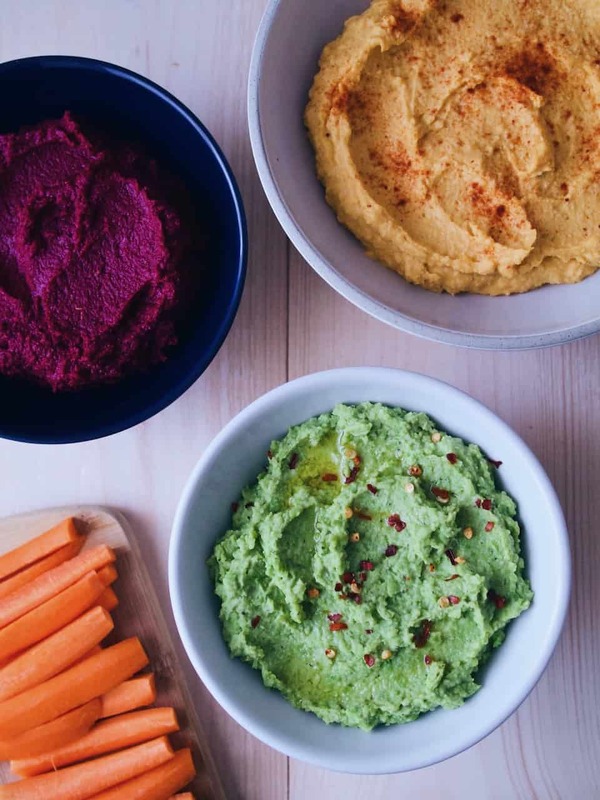 As an athlete with high energy demands as well as a woman recovered from years and years of disordered eating, the topic of food is close to my heart. But. It’s not close to my heart in an obsessive, over-controlling kind of way, anymore. It’s not close to my heart in a my-life-circles-around-what-I-eat kind of way. Food is my fuel. Food is satisfying. Food can heal you, warm you, create memories with you. Food is great. But boy, have we made it complicated. Diets left, right and center. New “superfoods” every week. It’s exhausting, just keeping up with it all. Those were some of the thoughts and themes I chose to write about in that first post. In this one, however, I’d like to share how we actually eat, Mike and I. What our food philosophy is, in other words, and how we ended up eating the way we do today. Now, does one really need to have a “food philosophy”? Of course not. In a way, one could argue sharing something like this is feeding into that food is complicated circus. But our thoughts aren’t so much about grams of sugar, detoxes and eating clean as they are about appreciating the resources we have on hand, treating this planet with great care and making sure our own bodies get enough fuel to take us wherever we want to be taken. Food is precious, yet human kind is treating it as… well, something not so precious, unfortunately. 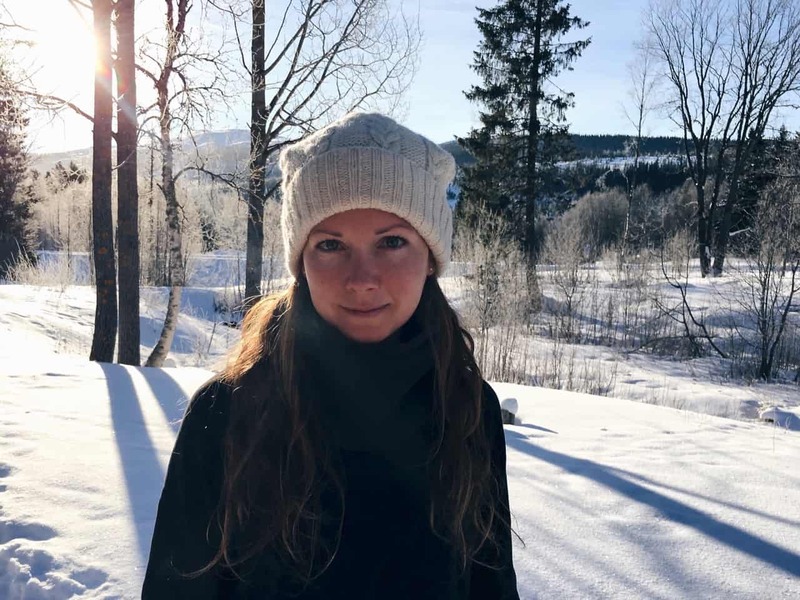 At 31 years old, Sophia is happily re-rooting herself in her native Sweden after many years of living in New York City (where she learned everything about donuts, bubble tea and, well, pizza). She is a runner at heart, about to develop a pretty serious green thumb (although so far it’s mostly been dirty) and loses track of time when foraging wild berries and mushrooms. A lover of apples. And muesli. Michael is a 34-year-old born and raised New Yorker who traded engineering and the urban jungle of Manhattan for running through the woods and living simply in the Swedish archipelago. He is quite the accomplished home cook and a map-collector extraordinaire, as well as a natural when it comes to cross-country skiing (a sport most necessary to embrace once you’ve made Sweden your new playground). But more than anything though, Michael loves mint chocolate chip ice cream. Copyright © 2019 Live Slow Run Far. All rights reserved.